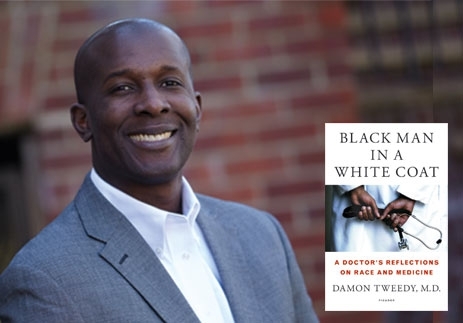 Book Club: Black Man in a White Coat: A Doctor's Reflections on Race and Medicine, by Damon Tweedy, M.D. Black Man in a White Coat examines the complex ways in which both black doctors and patients must navigate the difficult and often contradictory terrain of race and medicine. As (author Damon) Tweedy transforms from student to practicing physician, he discovers how often race influences his encounters with patients. Through their stories, he illustrates the complex social, cultural, and economic factors at the root of many health problems in the black community. These issues take on greater meaning when Tweedy is himself diagnosed with a chronic disease far more common among black people. In this powerful, moving, and deeply empathic book, Tweedy explores the challenges confronting black doctors, and the disproportionate health burdens faced by black patients, ultimately seeking a way forward to better treatment and more compassionate care.